Today our final project is due in my photo group. The topic is whimsical, which has caused a lot of consternation and debate among some of the members. Our teacher included dreamy in his definition of whimsical, but I chose to bring a not particularly dreamy photo which has appeared on this blog previously in a not so whimsical form. Here is the original photo, taken at sunrise from our driveway. A view of the snowy hill and houses across the main road from us- bathed in the early morning sunlight- fingers crossed that we have more snow this weekend! 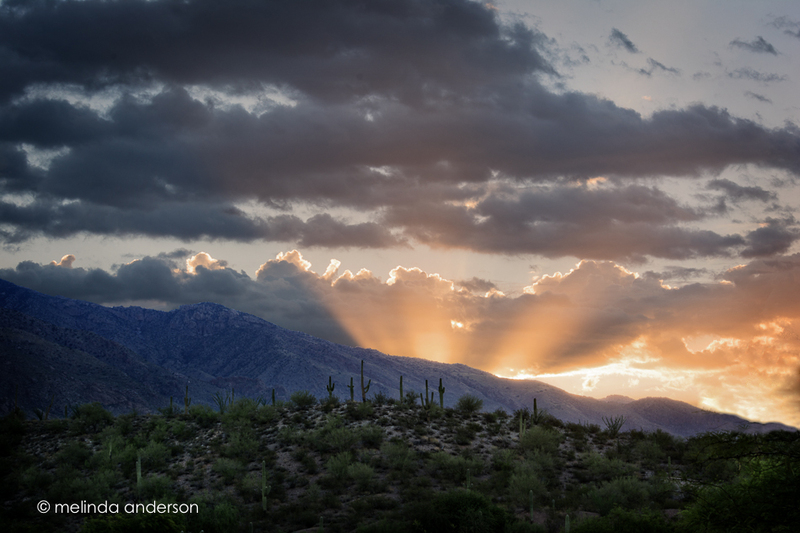 We are blessed with a view of beautiful Arizona sunrises, which I never get tired of photographing. Lonnie and I were both out there as the sky shifted from red and pink to orange and finally blue this morning. I’ve just returned from a wonderful, quick midweek getaway to Tucson, where we celebrated our 44th anniversary at a beautiful resort. We did a couple excursions in the mornings and then spent the afternoons relaxing by the pool- my kind of vacation! I always say (correctly so) that I am not a landscape photographer- I don’t have all the best gear, I hate to use my tripod out in public, and I don’t like getting up early to get the best light! But recently it dawned on me that, when I travel, I always take landscape photographs anyway- usually without a tripod and never in good light- even though I KNOW BETTER. I decided that on this trip I would take my tripod and perhaps even use it in public if appropriate. Since we had a view from our hotel room of the mountains, I decided to get up early one morning and do it right. The night before, I put the camera on the tripod, attached the cable release, and adjusted the settings. I set my alarm and got up well before the sun came up; I haven’t counted the photos but I clicked that cable release many, MANY times over the course of an hour. I really like how the rays of the early morning sun peek up over the horizon in this image. I also took my tripod along when visiting the Mission San Xavier del Bac- but you’ll have to wait for those photos!